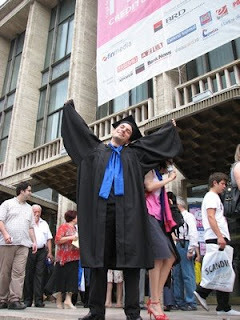 Yes, I finally and eventually and happily graduated! 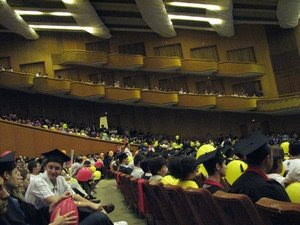 28th of June was the big day when our graduation festivity was planned to take place. Yeeey! 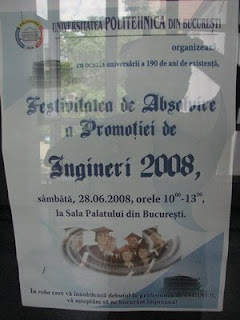 It was a tough journey through 5 years of college here at the Faculty of Automatic Control and Computer Science from "Politehnica" University (Bucharest). 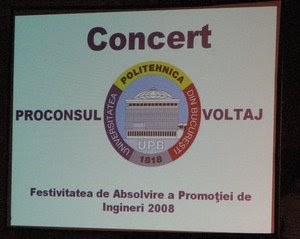 The university prepared quite a nice festivity for us: well organized and with many good speeches (ok, there were 1 or 2 bad speeches, but maybe I just didn't like them). I liked the festivity overall; it made me feel good. 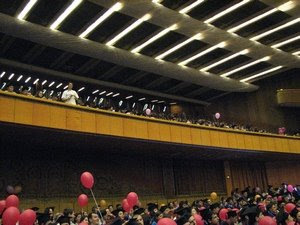 Besides, it took place at Sala Palatului (Palace Hall, which is a location that I very much like) here in Bucharest. 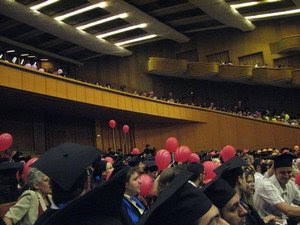 The university borrowed us black robes, black square-shaped hats and scarves; the colors of scarves and balloons that we wore were supposed to represent the college we came from. I met a great part of my friends from faculty: from former classes I took in faculty (they split our original class at one time according to the direction we wanted to study; I also took some optional classes meanwhile studying my primary direction) and some from high school. Unfortunately I couldn't enjoy the festivity near all my good friends from faculty since some of them were studying for their diploma project abroad and they'll be coming back at the end of July. The festivity ended with a short concert (50-60 minutes), but we hardly payed any attention: everyone was too busy talking and making pictures. Hey, one usually graduates once, so we must use at best that time! My favorite picture of all, is the picture representing myself (of course!) happy (of course!) right after the graduation festivity (obviously!). I am sorry i missed it. But I am somehow happy you missed me. And us all. It's good you didn't miss it too.